It’s not often that I review a game so new there isn’t even a Wikipedia page about it. 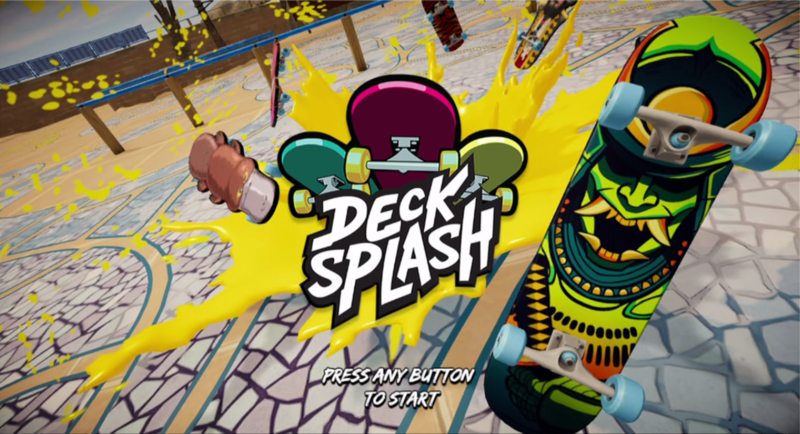 Decksplash was released on November 2, 2017 on the Steam platform, developed and published by Bossa Studios. It is a skateboarding simulator in which the player can perform tricks while competing with other players in the same arena. 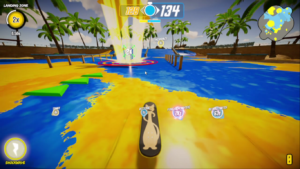 Decksplash might be best summed up as Tony Hawk meets Splatoon with elements of Rocket League. The player controls the movement of a skateboard around an arena either in practice mode, or with other players online in team against team matchmaking play. Players are awarded points for tricks they successfully perform and also accumulate points for how successful their landing was. Each time a trick is successfully performed with a successful landing, a splotch of paint the color of their team explodes in all directions from the center of the player’s skateboard with a radius size proportional to the number of points awarded for the trick. The more a player performs a specific trick, the fewer points they receive each time they perform it. 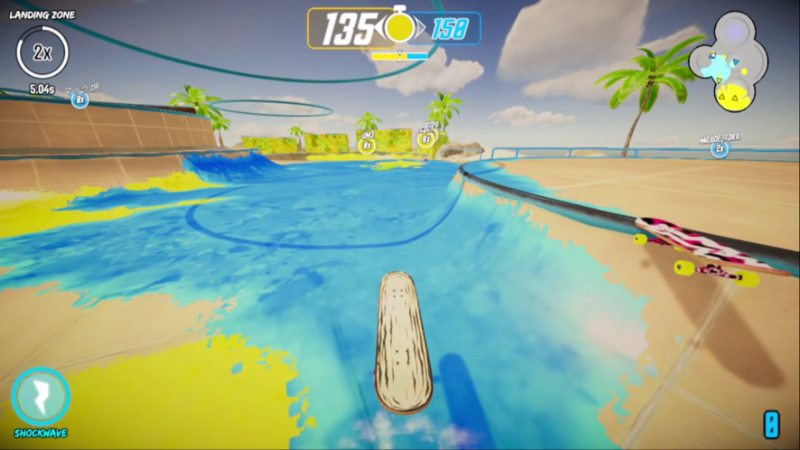 The game seeks to encourage players to always attempt something new. This begets certain strategies. Some times are better than others to use the high points on tricks a player is particularly good at, while attempting the riskier tricks is preferred at other times. To be competitive, Decksplash insists you read the proficiency of the other team and adjust your strategies to maximize your point count throughout the match. You’ll want to score your greatest points when the other team is floundering. In online play the objective is to accumulate the most points and color the majority of the arena. Each match begins with both teams having 150 seconds on the clock. Whichever team’s color lays claim to the majority of the surface area of the map receives a countdown on their team’s clock. As soon as one of the team’s clocks hits zero, the game ends and the team with zero seconds remaining is the winner. Customizing your deck. Default Pickleboard shown. The skateboards can be customized via the “Customize Deck” option on the main menu. 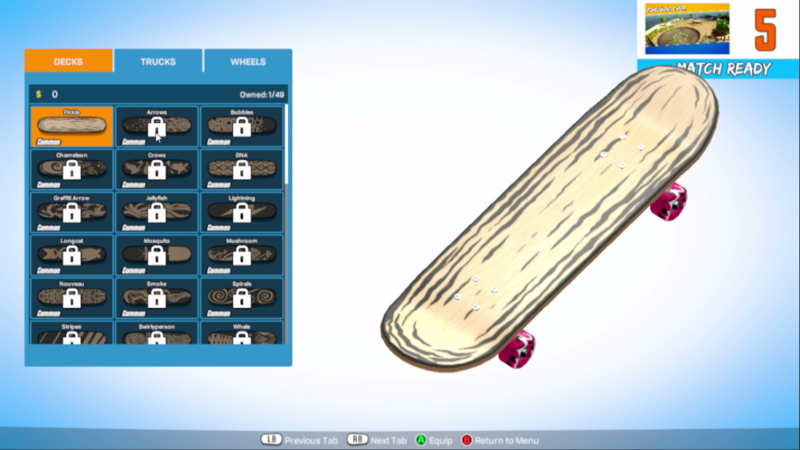 The player begins the game with a typical default skateboard with a common truck and pink wheels. All other options are locked and unavailable on first play. As the player accumulates more points and reaches milestones in the matches, they will level-up and receive loot boxes. Loot boxes contain decks, trucks, and wheels that can be selected for the game matches. I was able to get to level three within thirty minutes and had accumulated one new deck, two trucks, and three different colors of wheels. The game developers recommend playing Decksplash with a game pad. Given that I did not happen to have one handy at the moment, I used a keyboard for this particular review. The up, down, left, and right arrows are used from movement of the skateboard. “A” yaws left. “D” yaws right. “W” pitches up, while “S” pitches down. “Q” rolls left, and “E” rolls right. Periodically you will have a shockwave available to use. You can trigger this by using the “F” key. 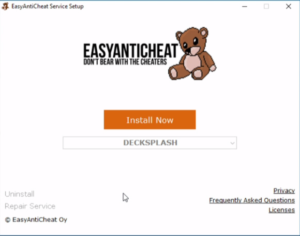 EasyAntiCheat Service is required to play. 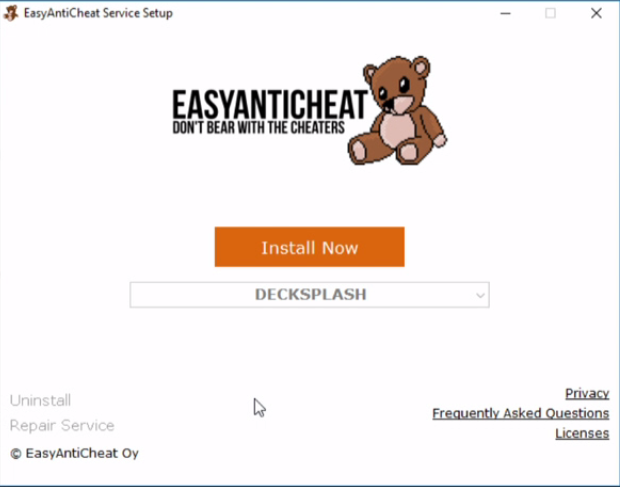 After installing Decksplash and prior to loading the game for the first time, a piece of software called EasyAntiCheat Service was installed to my machine in order to run the game. To my knowledge I’ve never encountered this program before so I did a bit of research on it. It is apparently a popular program for game companies to use to impede cheating on many of their game offerings. I have read that it scans your system memory and takes random screen shots to ensure you’re playing fairly. It is currently used extensively in eSports, so it does have a legitimate track record in the industry. That being said, I would imagine that a random screenshot or memory scan at the right (or wrong) time could potentially reveal more information about the user than the user would ever intend to make public. I wanted to include this here to warn any paranoid users like me, proceed with caution. It also makes me wonder how difficult it would be to get this game to run in Linux via Wine given that there is a separate anti-cheat component required to run the game. All in all, Decksplash is a colorful game that is a considerable amount of fun. 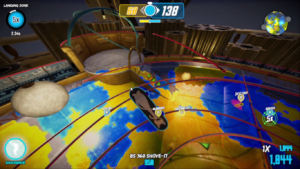 I enjoyed making color splotches across the map, leveling up my skateboard, and performing increasingly challenging tricks. The matchmaking is quick, easy, and balanced. So far I haven’t been frustrated by Decksplash; I’ve only been having a blast. Decksplash is available to play for free on the Steam platform until November 10, 2017. If you are reading this prior to that date, go play it for yourself and see what you think. This entry was posted in 2 Player, 2 Player Competitive, 2 Player Cooperative, 2017, 3 Player, 3 Player Competitive, 3 Player Cooperative, 4 Player, 4 Player Competitive, 5 Player, 6 Player, Action, Bossa Studios, Bossa Studios, C0/S100, First Impressions, Online Matchmaking, Simulation, Single Player, Skateboarding, Steam Download, W10-0006, Windows 10, Windows 10 Compatible. Bookmark the permalink.